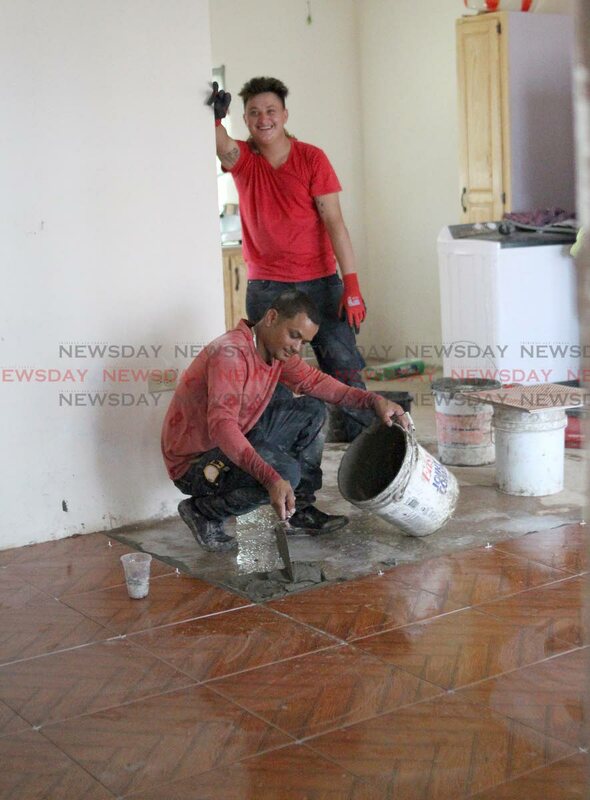 A work crew completes tile works in one of the Greenvale homes affected by devastating floods in October last year during an official tour of the area by HDC managing director Brent Lyons, and other technical staff on Thursday. PHOTO BY ROGER JACOB. REPAIR work to all of the Greenvale Park, La Horquetta units that were affected in last October’s floods should be completed by the end of February, Housing Development Corporation (HDC) managing director Brent Lyons said yesterday. During a tour of the development, Lyons told reporters that of the 483 units that were damaged in the flood waters, 50 had already been completed, signed off and handed over, while the others were in various stages of completion. “We anticipate that by the end of February all the units would be completed in Greenvale,” he said. Lyons, who was accompanied by HDC’s technical team, said a major challenge in the corporation’s ability to fast-track repair work was the availability of homeowners. Residents said they were generally pleased with the work being undertaken by the contractors. Lyons recalled the HDC had received complaints from homeowners about the slow pace of work in the aftermath of the deluge. “In the recent past, we have had some complaints from residents that the work might have been of a substandard quality as well as not timely. As you can see, the works are significantly advanced and the quality is certainly good and acceptable in most cases. Lyons said some of the contractors who fell short in that regard were replaced before Christmas while others were let go last week. Claiming no money was wasted from the shoddy repair work, he said none of the contractors retained by the HDC had been paid. Told that some residents were making unreasonable requests, Lyons said the HDC’s commitment was to restore what was damaged. “A few residents have asked for some additional things to be done and they have made their private arrangements with the contractor for that to happen. He said the scope of work included repair of cupboards, tiles, doors and some repainting where necessary. Lyons said apart from Greenvale, which was one of the communities hardest hit by the floods, repair work also was due to be carried out in Oropune, near Piarco. Reply to "Greenvale repairs to be done by next month"